Jessica’s doing a work placement at Punch Records and is blogging about it. Please drop in and say hi. Dunc from Autumn Store has been eyeing up The Indie Lounge in Selly Oak which apparently opened it’s doors yesterday. They seem to have zero web presence though. 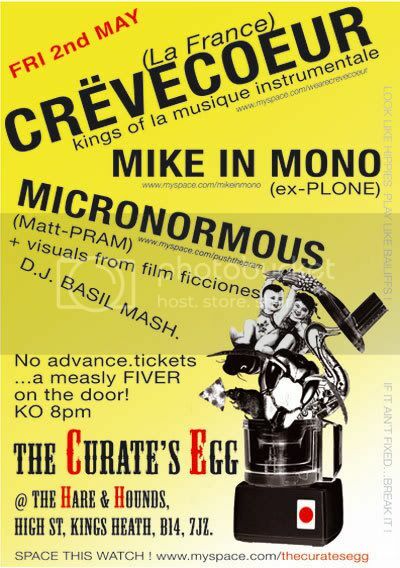 Tonight The Curate’s Egg have got Crevecoeur playing as part of their electronica extravaganza (eggstravaganza? Um, sorry) at the Hare & Hounds – peep the flyer yo. 8 May is Big Picture Day and every photo added on that day will be in with a chance of appearing on giant billboards around the region. Craig Holmes is an award winning photographer based in the Midlands, who predominantly photographs architecture, property and cities for a wide variety of clients and he’s just launched the nicely blog-ish Arcpic.com. Bryn is hosting an exhibition at the Custard Factory in The Gallery (next to the ornamental lake) until 6 May (via Spaghetti Gazetti). Gail Troth has an exhibition at the Three White Walls gallery in the Mailbox until 3 June (via Andy Pryke). The next round of instructions for the Ludens in the Emergent Game have been delivered upon us and it’s a reconnaissance assignment. If you’ve not got involved yet then this bank holiday weekend should give you an excellent chance to catch up – it won’t take long at all and it’ll be worth it I’m sure. Hi! I am an Australian artist visiting Birmingham for 4 days to see relatives. Just wanted to say that I found this blog when I searched for info on art to check out while I’m here, and it seems to be a good resource for visitors. This “links” post is a useful way to locate some shows to catch, but as Birmingham is a biggish city, I’m wondering if there is more around that isn’t covered? Is there anyway you could make “what’s on” easier for a visitor to find quickly? Hi Amanda. There’s loads that CiB doesn’t cover. CiB isn’t really a ‘What’s On’ and isn’t meant to be anything like comprehensive. We’ll try and pick things out occasionally but for that sort of thing you’d be best picking up a copy of What’s On and starting there. Or maybe a ‘CiB recommends’ before each weekend would be a good idea. Thoughts anyone?